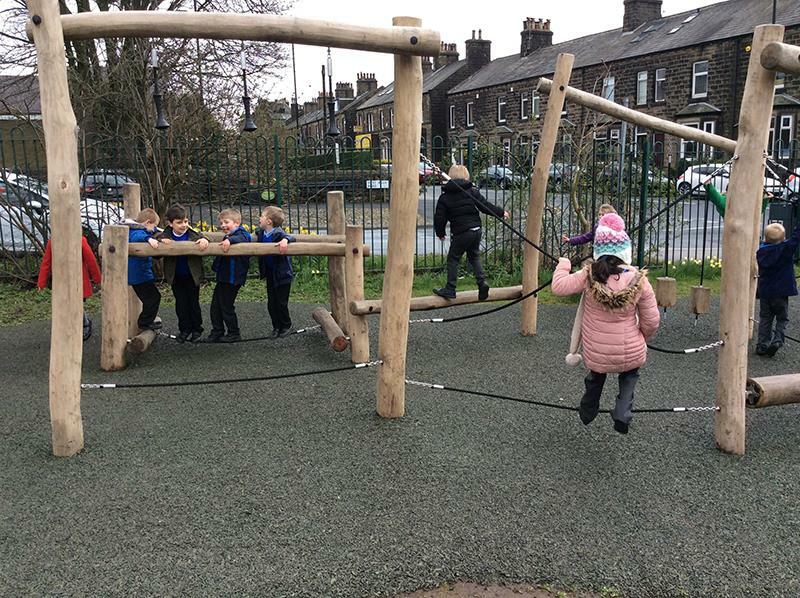 Guiseley Primary School’s existing playground equipment wasn’t challenging or stimulating pupils enough, which was resulting in poor behaviour from the children. They needed something that would help assist and improve their attention, attainment and attendance. The school wanted to change the playground to provide new physical challenges to channel the children’s physical energy in a structured way to help with learning. The equipment needed to fit in with the natural surroundings and landscape as well as combat slipping issues from timber trails that had been installed in the past. KOMPAN installed a Robinia Trim Trail for Guiseley Primary which fits in with the natural surroundings of the school. A trim trail is a fantastic product to provide physical challenges and cooperative play. The children can race around the trail or help each other to get through the course together. The new playground was a success, attainment has been improved as the children are concentrating more in class after letting steam off during breaks. Attendance has gone up as the equipment is being used as a reward system for the class that has the highest attendance each week. On top of that they have also introduced a 'Wake Up Shake Up' scheme that is helping get children active in the morning and ready to learn by the time they get into the classroom. Sally Buckton, headteacher: “Our new equipment not only looks great and fun, it is impacting attendance, attention and attainment at our school. Attainment has improved as the physical development and coordination is helping students cognitive development and reading/writing skills. “Attendance has improved as the children are very keen to use the equipment. Each year group has one day a week to use the timber trail – if they aren’t there they don’t get to play! It is also used as a reward scheme for the class with highest attendance rate from the previous week. Planning for a new play area?